NH NeuroSpine is helping to make invasive spine surgery more accessible to patients across the globe! After spending over a year developing and performing a new minimally invasive surgical technique for spinal fusions, Dr. Kleeman is now involved in the visiting surgeons program and helping to teach this new method to surgeons everywhere. Not only are surgeons from around the world flying in, observing and training on this new technique, last week a filming crew entered the operating room at Catholic Medical Center. 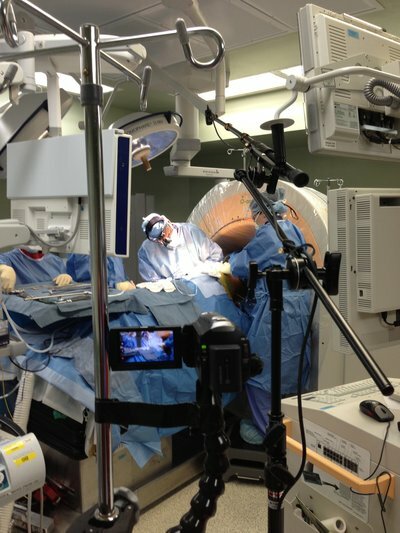 With seven cameras taping they were able to capture all aspects of the surgery at the same time. Dr. Kleeman explains how they will use this footage, “The goal is that we create a training video capturing all details from different perspectives. Surgeons can then have the multiple angles running simultaneously from their computer screen. This represents a new and innovative approach to surgical teaching techniques.” For more information on minimally invasive spine surgery visit nhneurospine.com.